Jackie Hagan presents This is Not a Safe Space, the aptly named one-woman show, brought to us as part of ‘Common People: the working-class theatre festival’. It may be tautological to describe what a working-class theatre festival is all about but, as it was introduced to us, it’s worth a mention. Camden People’s Theatre is looking to produce theatre that is representative of the people and feeling of Camden and that includes the strong working-class presence they feel is there. As such this festival is specifically designed to provide theatre produced by working class people and/or dealing with issues that affect working-class life. This is Not a Safe Space covers a broad selection of the issues that working-class people with disabilities and mental health issues face and touches on the personal and political elements of these with a heavy sampling of Hagan’s personal experiences lending weight and integrity to the overall message. The piece itself is a mix of excerpts from interviews Hagan herself has carried out and, a series of sequences of solo performance incorporating comedic monologue, audience interaction, poetry and some interpretive puppetry. The scene is set with Hagan’s direct introduction, giving a little background on herself and the performance and offering the disclaimer section of the evening, the main one of which is for the unapologetically direct and while we’re all adults, it’s not a bad call to have made as it’s certainly not written in the traditional tones of thespianism. And why would it be? This is a performance created by and carried by Hagan’s fierce personality. Fiercely unashamed, fiercely defiant and fiercely loving all at once. She performs with confidence and presence and the way she sets the scene on each section it feels like we’re sitting listening to the life stories of an old friend or long-lost relative. Not to say the topics concerned won’t take you out of your comfort zone; PIP, Working-Class Tourism and Networking for the Unemployed are just a few of the topics touched upon quite aside from Hagan’s own story of how she lost her leg and her struggle with mental health issues. The content of This is Not a Safe Space is challenging, thought-provoking and emotive. It’s something many of us think about every day but try to push aside just to get by. It’s the truths that cut a little too deep. But told in a compassionate, intelligent way. Yes, there’s a political and social point there, but rather than going out on the attack, this is a journey of exploration and understanding, perhaps meant to teach rather than to merely tell. The different elements and media used are coordinated well with timing close enough to work near-seamlessly but loose enough to allow for an occasionally inconsistent one-legged movement around the stage; a no doubt necessary but nice touch. And, while the elements of puppetry may not work for everyone, I think they lend a little warmth and charm to a section that could otherwise be bleak. If a criticism were to be levied at all, it would be that perhaps some of the poetic elements weren’t as strong as the other sections but, that included, this is a great piece of theatre that I thoroughly enjoyed, and I would recommend it to anyone. Anyone over the age of 18 though, of course. In August 2017, a Labour party report criticised working-class under-representation in the arts, and demanded the cultural sector work harder to fill the “class-shaped hole” in their audience and workforce. In response, Camden People’s Theatre have launched a new festival exploring class – is working class cool, is there a class-shaped hole in the diversity debate, and who gets to tell working-class stories? 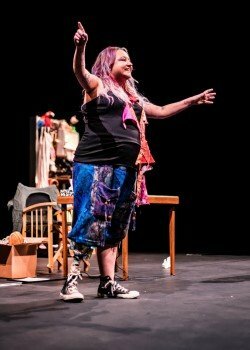 The show is headlined by This Is Not A Safe Space by amputee poet and performer Jackie Hagan, who has interviewed over 80 people on the margins of society about the impact of benefit cuts. Jackie weaves these narratives together with poetry and anecdotes, celebrating the weird, the wonky, the unruly, and the resilient. There’s Trish who is sick of doctors not taking her seriously because she is mentally ill and disobedient. Neil who got arrested for the first time because “you can’t run when you’re laughing”; and Karen who is a wheelchair user who thinks we’d be better off letting sheep take over the world because humans are making a pig’s ear of it. Last year, Jackie won the inaugural Jerwood Compton Poetry Fellowship, represented the UK for poetry in Rio, was the focus of a Channel 4 short documentary and is currently working with Hattrick productions on a sitcom set in Skem. Read our Q&A with Jackie Hagan.